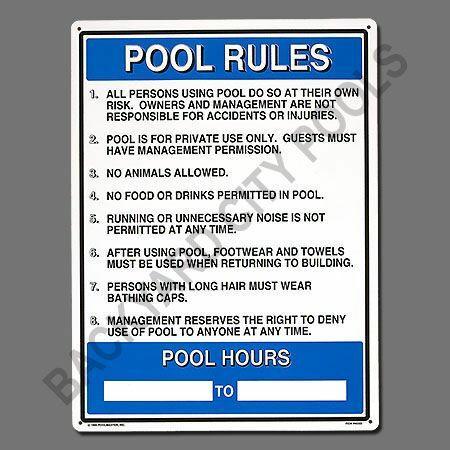 This Commercial Pool Rules Sign is 18" x 24" and constructed of heavy duty plastic. It has pre-punched holes for easy hanging and features U.V. resistant ink. 1. All persons using pool do so at their own risk. 2. Owners and management are not responsible for accidents or injuries. 3. Pool is for private use only. Guests must have management permission. 5. No food or drinks permitted. 6. Running or unnecessary noise is not permitted at any time. 7. After using pool, footwear and towels must be used when returning to building. 8. Persons with long hair must wear bathing caps. 9. 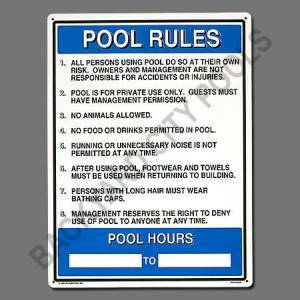 Management reserves the right to deny use of the pool to anyone at any time.